Internet and social network claims that Angelina Jolie has purchased a prime piece of Putnam real estate are not true. Reports indicated the actress acquired Petra Island in the middle of Lake Mahopac for $20 million, but according to the daughter o… Please login below or purchase a subscription to the Putnam County Courier to access this content. 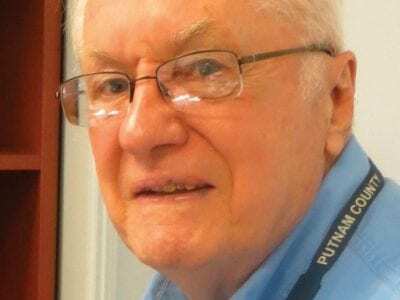 Health Commissioner Dr. Allen Beals has disputed a claim that Putnam is the “fattest” county in the entire New York Metropolitan region. The Centers for Disease Control and Prevention released a report last Friday charging that “wa… Please login below or purchase a subscription to the Putnam County Courier to access this content. 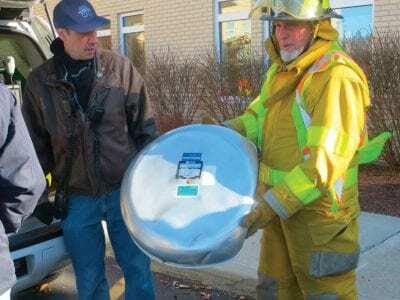 Strong winds ripped this air conditioning cover from the hospital’s roof. It went sailing through the air, narrowly missing a woman walking in the parking lot and Carmel firefighter Lou Margolus (right). Nothing is more frightening for emergenc… Please login below or purchase a subscription to the Putnam County Courier to access this content. Helen Chiera is Putnam County’s newest American citizen. 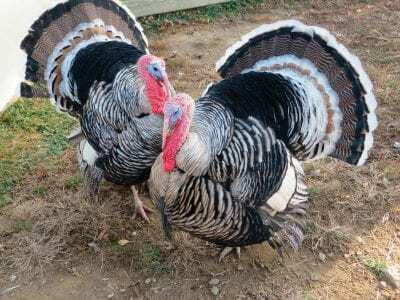 Helen Chiera has a lot to be thankful for this week. After 33 years in the United States, the Southeast woman has become a U.S. citizen. Chiera was among 150 others from around the globe … Please login below or purchase a subscription to the Putnam County Courier to access this content. Bob Bennett packed boxes at the Board of Elections office last week prior to his retirement November 22. Bob Bennett, New York State’s most senior Elections Commissioner with 40 years of service under his belt, has retired. Last Friday after pa… Please login below or purchase a subscription to the Putnam County Courier to access this content. Maureen Salinger (left) and her veteran pie helper Kate Bartsch of Purdys take a breather Tuesday before preparing to bake a rack of delicious pumpkin pies. Maureen Salinger can’t wait to put her feet up on the day after Thanksgiving. After bak… Please login below or purchase a subscription to the Putnam County Courier to access this content. Anthony Rubino, dapper as ever, surrounds himself with four MHS students, including Marissa Burke, Lindsey Casler, Jessica Russo and Isabel Quinones. 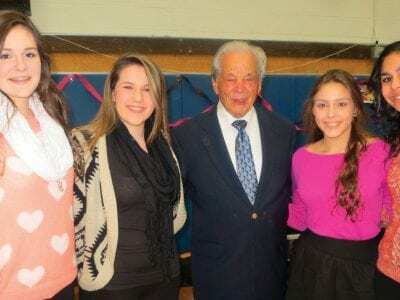 Sunday’s prom at Mahopac High School bridged the generation gap. More than 300 senior citizens were … Please login below or purchase a subscription to the Putnam County Courier to access this content. 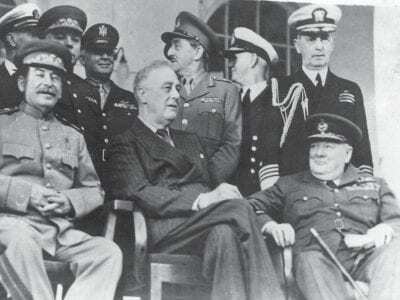 The big three at the 1943 Tehran conference: Stalin, FDR, and Churchill. Winston Churchill turned 69 on November 30, 1943 – only eighty years ago. The toasts at the summit conference in Tehran were interminable that night. It was the third nigh… Please login below or purchase a subscription to the Putnam County Courier to access this content.